I have just read this 10 chapters of this historical fiction book just within 1 hour, and I cannot put the E-book down. 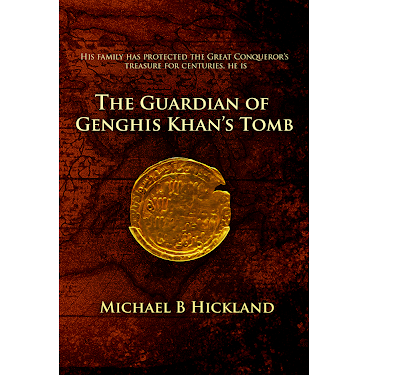 Michael B.Hickland's The Guardian of Genghis Khan's Tomb easily blends and wove historical and fictional account of the hunt for Genghis Khan's untold wealth in a very exciting and thrilling manner. The language used is very simple and straightforward, easy to understand without losing any the tempo in the storyline’s flow. Furthermore, he introduced a lot of colorful characters and gave compelling historical background with each one of them. There is a lot of details about the Mongolian culture and history that added intrigue and realness into the story. As this is a historical fiction, I believe he did a lot of research into the WWII struggles between the Russians, Germans, Chinese, Americans & the Japanese over the Chinese continent and tweaked it into the storyline. He seamlessly switches conversations between different factions and countries that were racing to get hold of the treasure. And I cannot wait to finish the entire E-book as the fate of the Genghis Khan's tomb lays waiting. You can get from Amazon. See this link. Genghis Khan conquered over 30 countries with around 3 billion people in his lifetime. With such vast territories, he accumulated tremendous wealth from his conquered nations and tributes to the Mongolian empire. In 1227 the Great Conqueror died. Since then, finding the Tomb of Genghis Khan has been the obsession of tyrants, adventurers and treasure hunters alike. The legend says that, in order to keep his tomb’s location secret, Genghis Khan slaughtered hundreds if not thousands of his captives after they had been forced to dig his burial site. He had amassed untold wealth with enormous quantities of jewels, gold and silver from his conquests which is believed to be buried with him. So why hasn’t his crypt been found in almost eight hundred years? 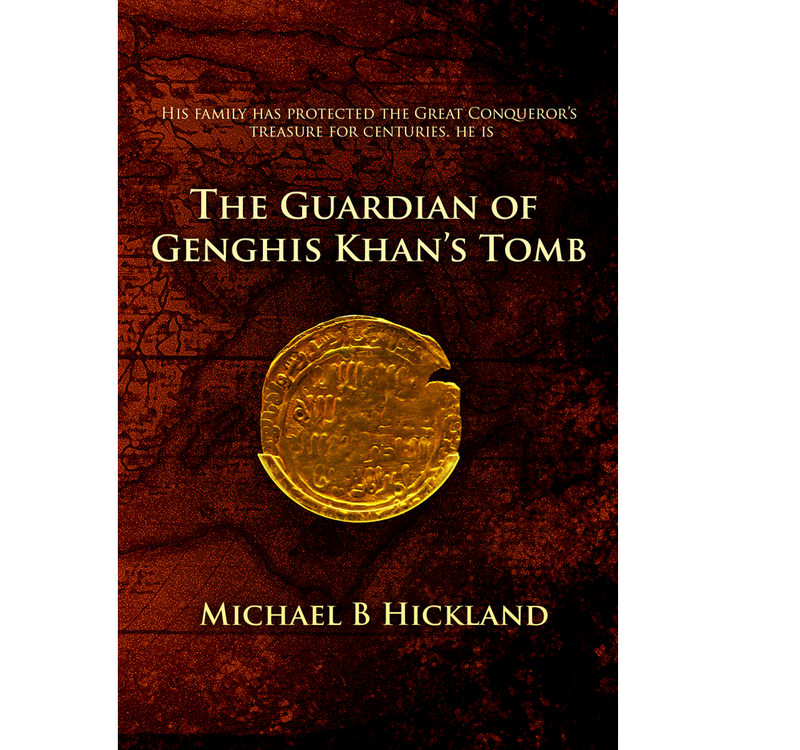 In Michael B. Hickland’s The Guardian of Genghis Khan’s Tomb, the Great Conqueror extracts a sacred oath from a special advisor. It binds both this trusted counselor and his family forever to protect the tomb and the most immense treasure ever known. Can The Guardian of Genghis Khan’s Tomb manage to keep the gravesite safe and his beloved country, a fledgling democracy, from being overrun? Or will war break out between the world’s Superpowers? This e-novel is a fast paced historical fiction thriller full of turns and twists. It ends with a conclusion that would stun even the Great Conqueror himself. The wisdom of Genghis Khan was manifested in all his accomplishments. He came from one of several nomadic tribes occupying an area of Central Asia plagued by drought. Game had become scarce and farming almost nonexistent. Before becoming the Great Conqueror, he was named Temujin. His father had been a chieftain of the Kiyad and was murdered by another clan. Temujin recognized early on that the ongoing conflict among the tribes would end badly for all. Strong and ruthless, he was a brilliant military strategist who made the necessary alliances to build a small army. With it he set about conquering each of the warring tribes and bringing them under his banner. After successfully uniting the tribes into a Mongol confederation, he sought to feed his impoverished and malnourished people. He gazed beyond his border. Temujin knew that Western Xia and its Tangut population had irrigated its grasslands and raised large cattle herds. So he went to war with the Tangut and invaded Western Xia. By 1209 he prevailed and had it under his control along with its Hexi Corridor, an important East/West trade route. Once again Temujin demonstrated wisdom by assimilating the Tangut advances in literature, architecture, music and the arts into the Mongol culture. He utilized the trade goods and foodstuffs of this new Mongol conquest to improve the economy of the combined territories. Having added Tangut soldiers to his army, Temujin also was collecting tribute. Soon he received an emissary from the Emperor of the Jin demanding his own submission and tribute from the Mongols as his vassals. His people had long suffered under Jin influence and arrogance. The Jin had a huge army estimated at 600,000 men that dwarfed that of Temujin. But, the Jin Dynasty was extremely wealthy. From his spies, Temujin knew that the Jin army was occupied far to the South with border wars. Making the most of his opportunity, with a force of 70,000, he marched into the Jin Empire, successfully raiding wherever he went. He concentrated the raids on rural areas, terrorizing the inhabitants. Very soon these people were flocking to the cities for protection. After selecting such a city Temujin laid siege using siege weaponry and strategy he had taken from Muslim and Chinese engineers. City after city fell to the Mongols. Soon Temujin and his army, burgeoning with Jin deserters, were at the gates of the Jin capital Zhongdu (Beijing). The capital was overcrowded and could not begin to feed all the people. Before long Jin soldiers were ordered to execute the peasants which pushed the remaining population towards rebellion. Now the Jin Emperor sued for peace and agreed to pay Temujin a huge annual tribute. Quickly the Jin Emperor moved his court away to Kaifeng. Feeling double crossed Temujin took Zhongdu and all it possessed. The Mongol’s spoils of war were mind boggling. From there Temujin’s forces went deep into China, plundering everywhere they went. Vast quantities of gold, silver and jewels were constantly being transported back to Karakorom, then the Mongol capital. As a result of his external victories he had been given the title of Genghis Khan. His first conquest came in the West over the Khanate of Kara-Khitan, a country of almost a million square miles. Its treasury of Chinese coins, operating gold mines and annual tribute provided him with new wealth and ongoing income. It is very likely, not there looking for the tomb of Genghis Khan - that's it, and cannot find it. Very likely, it is in other part of Eurasia. As a matter of fact, most of the descendants of Genghis Khan and his native nation now living among Bashkirs, Kazakhs,Tatars, Uighurs and other Turkic peoples. Read a book "Forgotten Heritage of Tatars" (by Galy Yenikeyev) about the hidden real history of Tatars and their fraternal Turkic peoples.This book you can easily find on Smashwords company site. On the cover of this book you can see genuine appearance of Genghis Khan. It is his lifetime portrait, which is very little known. Notes to the portrait from the book say: \"...In the ancient Tatar historical source «About the clan of Genghis-Khan» the author gives the words of the mother of Genghis-Khan: «My son Genghis looks like this: he has a golden bushy beard, he wears a white fur coat and goes on a white horse...» [34, p. 14].